Given what's happening in the sky right now, you may find yourself asking, do eclipses, major configurations (like the recent grand cross in the sky), and the infrequent major aspects between the outer planets (like the Saturn/Uranus opposition in the sky this year) affect everyone? The short answer is, "Yes and No." Yes, eclipses and mundane aspects and configurations affect us all, because when they affect some of us, they affect everyone, because we are all inter-related. And, "yes" again because they affect global issues, like the economy, politics, and the weather, which have a "ripple-down" effect on most, if not all, people. And yet the more precise answer is "no". Eclipses and mundane aspects and configurations may not impact us personally at all. Unless a major event in the sky actually aspects a person's chart very closely, the person won't be greatly (or even at times noticeably) influenced by it. There is one significant exception. If a person has the same configuration in their chart as is going on in the sky, it may indeed "trigger by echo" energetics in the person's life, even when transiting events are not in orb of natal points. For example, a person with Mercury closely combust the Sun may become "touchy" every time Mercury is combust in the sky. Similarly, a person born at the time of an eclipse may be hyper-sensitive every time an eclipse occurs. But this is indeed the exception to the general rule that major sky events will not affect a person directly unless planet(s) in their chart are tightly aspected by the configuration in the sky. I cannot tell you the countless number of times I have seen both clients and astrologers "mis-attribute" what was going on in their lives to the wrong celestial events because they were "missing the forest for the trees" by ignoring the orbs involved. The reason why I focus on tight orbs (less than 2 degrees) for this type of analysis, (and for predictive work in general) is because otherwise too many aspects are created, and the important ones become "lost in the noise" of the less important ones. Please note that in evaluating the effect of sky-to-sky events upon a person's chart, I do not include trine and sextile aspects between the sky and the chart as relevant (except where there is a grand trine or major sextile configuration in the sky). And, I focus primarily on aspects to influential natal chart points: the angles (Ascendant and M.C. ); the Lights (Sun and Moon); the Chart Ruler (Ascendant lord); angular planets (planets within +/- 5 degrees of an angle); planets alone in half the sky (meaning there are no planets in the two adjacent houses on both sides); and planets that closely aspect (less than 2 degrees) the Sun, Moon, or angles. Solar Eclipses will have their greatest effect when they are conjunct a natal planet or angle, and Lunar Eclipses, by their very nature (Sun opposite Moon), by conjunction or opposition. Partial eclipses will have much less effect than Total Eclipses. Therefore, to evaluate the impact of events between planets in the sky to a person's chart, one needs to look at the aspects formed from those planets to the natal points. Now, let's apply the general rule - that major sky events affect a person directly when they aspect natal planets by tight orbs - to President Obama's chart to see which celestial events will be significant in his life and which will not. Which of the current events (the eclipses, the grand square, or the opposition of Saturn to Uranus) were (or are) likely to affect President Obama? The eclipse on January 15, 2010 is the only eclipse this year that tightly aspected a planet in Obama's chart, a less than one degree conjunction to his natal Saturn. A few days later, despite his intensive campaigning for Martha Coakley, the Massachusetts Attorney General and Democratic candidate for Senate, in a major upset, the Republican candidate Scott Brown won the special election becoming the first Republican candidate from Massachusetts to serve in congress since 1997. This was a stunning defeat for Obama and the Democratic Party. As ABC News stated: Republicans believe a win in the bluest of blue states, where a Republican had not been elected to the U.S. Senate since 1972, amounts to a popular rebuke of the president's agenda. The President will have a Lunar Eclipse conjunct his natal Venus on December 21, 2010, but the orb is almost 2 degrees, and unlike his natal Saturn, which is his traditional Ruler of the Chart, Venus is not a "major player" in his Western horoscope (but see the Vedic analysis below). 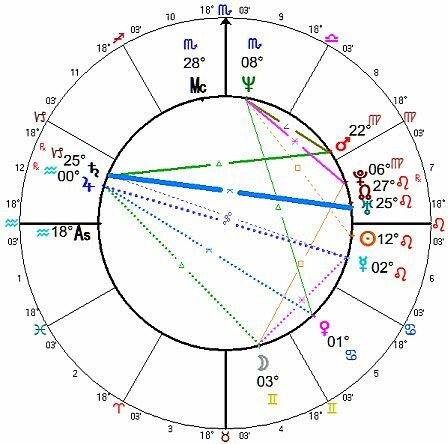 The only natal point aspected up to now by Saturn and Uranus simultaneously (during their opposition in the sky) is the M.C., and the aspects are a sextile and a trine. Therefore, the full weight of the Saturn-Uranus opposition has NOT fallen directly on President Obama thus far. But later this month, specifically on July 26th, 2010, Saturn and Uranus will both square his natal Venus within an orb of a degree and a half. What makes this significant can be best seen using Vedic principles and charting. His Venus is his Raja Yoga Karaka (most significant planet for success for his Sidereal Capricorn Ascendant) and it's the ruler of his 10th house, and located in the challenging 6th house (enemies, anxieties, acute illnesses, and adversarial situations in general). In addition, one of Saturn's most powerful aspects is the "backwards square" to any point (i.e. where Saturn is four signs forward of the natal point). This is in fact Saturn's position with regard to Venus, so we would expect some turbulent events and challenges for him at the end of this month. The impact may be partially tempered by the facts that the Saturn/Uranus opposition is neither conjuncting nor opposing Venus, and the orb is over 1 degree, and even more so because a doubly strong benefic Jupiter is in an applying opposition Saturn (which soothes and calms Saturn), but there will probably still be some noticeable bumps. One has to allow wider orbs (and include the Moon in the configuration in the majority of occurrences) in order to see this pattern in the sky. That is legitimate, however, because the figure so rarely occurs. Clearly, then, the most important of the Grand Squares in the 2009 - 2011 period is the one where the Moon is not alone at one of the points of the figure. That occurred on June 25th and 26th, 2010 when the Moon was conjunct Pluto at one of the corners of the square. 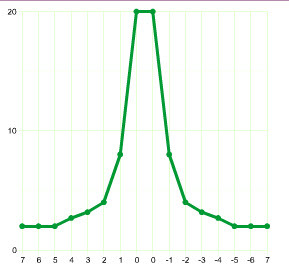 The "hot points", i.e. the degrees we want to inspect for the impact of the pattern on a person's chart, center around 0 degrees (+/- one degree) of the Cardinal signs where Mercury and Uranus occur, and around 4 degrees of the Cardinal signs, where the Sun and Pluto reside. Again, President Obama's Venus at almost 2 degrees of Cancer is most closely aspected by this Grand Square. Which of the recent events proves most impactful on the President's reputation and authority - the Afghan pullout deadline, his Gulf oil spill promise, or the current White House personnel scandals -- remains to be seen. But again because Venus is President Obama's 10th house lord in the Vedic chart, and is at one of the points of the Grand Square, he is definitely vulnerable at this time. In conclusion, this article was written to emphasize that events in the sky don't affect everyone equally at all. Each event impacts a fraction of the population: those whose charts "plug in" to the event. That is the most important principle illustrated in this article.